Join the discussion on /r/Nightcode and read the source code. 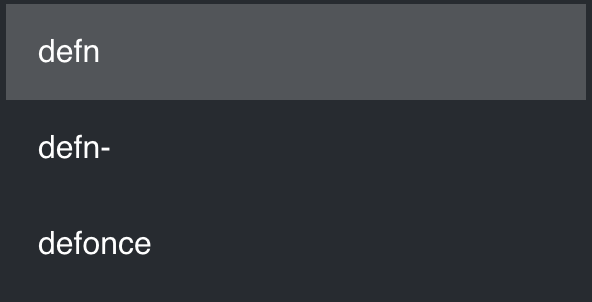 The right sidebar is constantly showing you code completion suggestions as you type. It works with all your third-party libraries as well. Just hit tab to select the first, or click another item in the list. 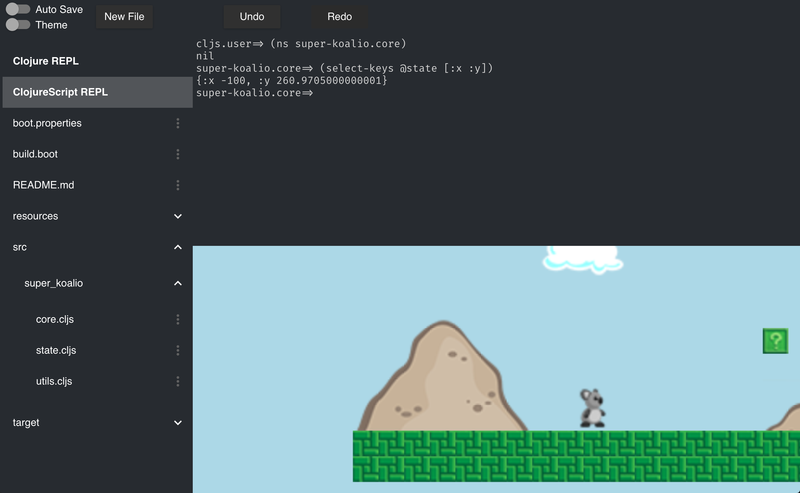 Since it's running inside your project, Nightlight provides a REPL for free. No need to fiddle with connections -- just click the REPL tab in the left sidebar. In addition to a standard REPL, you can enable an instaREPL for any Clojure file. That will cause the code to be constantly evaluated as you type, with the results shown on the left. Nightlight can optionally display a ClojureScript REPL tab that contains an embedded view of your ClojureScript app and a REPL that can access it. Additionally, it will enable the instaREPL in all your ClojureScript files. clj -m nightlight.core --url "http://localhost:3000"
That's it! This is quite possibly the simplest setup process you'll find for a ClojureScript REPL. Can I use this to develop on a remote server? Nightlight allows you to require a username and password. lein nightlight --user "admin passw0rd"
clj -m nightlight.core --user "admin passw0rd"
First, pass :host "localhost" to the Boot task (or --host localhost to the lein command). This will prevent Nightlight from accepting connections from outside localhost. How does this compare to Nightcode? 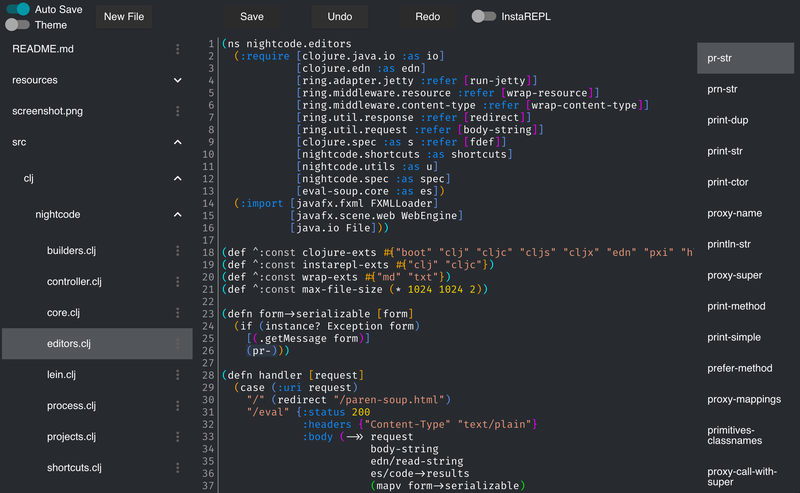 Nightcode is a Clojure IDE I've been working on for some time. It works like any traditional IDE, running in its own process. I have always struggled to provide features like code completion because they require a deep understanding of your project, including its dependencies. More powerful editors like Cider and Cursive manage to do this with some very complex machinery that I could never duplicate. Instead, I decided to rethink the problem. Since Nightlight runs inside the same process as your project, code completion and other advanced features are trivial to implement.